Christimas is only a week away and it’s been a crazy week between cooking and prepping for our annual Christmas party, cleaning the house, decorating the tree, stringing the house lights, wrapping presents, writing holiday cards – phew! Add in a visit from Mom last weekend, my car breaking down (and the subsequent attempts at repairs by the long-suffering Tai), trying to get wedding thank-you notes out the door, and some last-minute jobs from clients, and it’s a wonder I’ve managed to cook anything at all. Eggs are great that way; you can scramble an egg in less than a minute if you have to. Got another minute? Grate a little cheese and chop a few herbs to add to your scramble and it’s that much more tasty. Got 10 minutes? 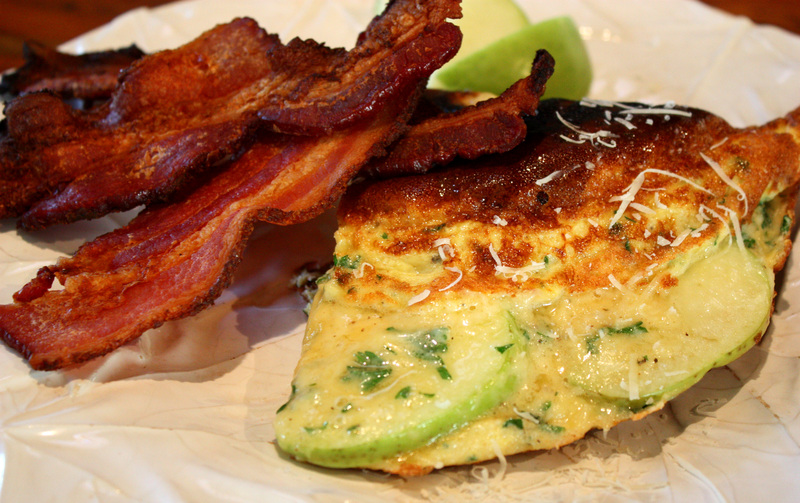 Make an omelet, complete with local, thick-cut, deliriously yummy, smoky and subtly spicy, wonderful bacon. You deserve it. Cook the bacon. I like to line it up on the broiler pan and cook it under the broiler (on the 2nd or 3rd rung in the oven so the splattering grease does not set fire to the oven – ask me how I know this!) for about 10 minutes until nice and crisp. This bacon was so thick that the edges started to burn before the middle was crisp enough for my taste, so I finished the bacon up with a minute in the microwave (on high power on a plate lined with paper towels). I find the broiler is the most hassle-free and least messy way to cook bacon, and it yields a clean supply of all that delicious bacon grease (which gets strained straight into a Ball jar and into my fridge for later use). Beat the eggs. Add eggs, optional milk or cream (I always add it to omelets as I feel it helps to give them that creamy, souffle-like texture), parsley and spices, and beat well with a whisk or fork. Prepare cheese and apple. Grate a mound of Asiago, or other semi-hard, grating cheese, and have at the ready. Slice the apple in half, remove the core, and slice one half into 1/8-inch slices. Cook the omelet. Heat about a tablespoon of the bacon grease over medium heat in an 8-inch omelet pan until it starts to sizzle. Give the eggs one last vigorous whisk and quickly pour them into the hot pan. The bottom of the proto-omelet should sizzle and firm up immediately; do not stir, but slightly roll the pan to level the eggs and round some of the egg mixture up to the sides of the pan. Allow the eggs to cook, undisturbed but for a swirl now and then, for a couple of minutes, until they begin to puff up and start looking more firm, but still wet. Sprinkle cheese over the entire surface of the omelet (reserve about a tablespoon for garnish). Layer apple slices over one half of the omelet. Continue to cook, adjusting the heat as necessary to prevent burning the bottom. When the middle of the omelet is nearly firm enough for your liking, flip over one half to fold the omelet over on itself. Continue to cook for another minute or so, or until the middle looks done (I like my omelets, and eggs in general, fairly hard; times will be shorter if you like a loose or runny omelet). If the bottom begins to burn before the middle is cooked to your liking, turn off the heat and cover the pan; the middle will continue to cook while the outside skin remains about the same. Serve. 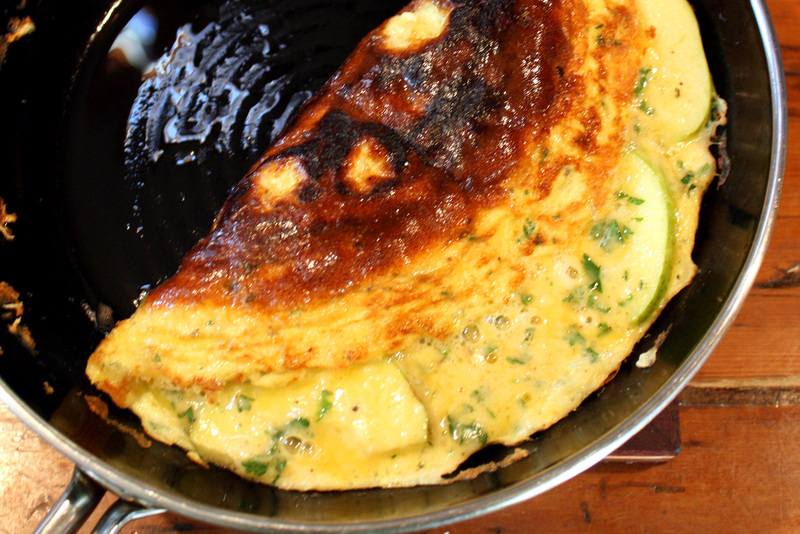 Using a thin metal spatula, cut the omelet in half and slide each half onto a plate. Garnish with the remaining cheese, some slices of apple (from the other apple half), and top with the chipotle bacon. Enjoy! A local hard cheese, such as Bardwell Farms Equinox or Sprout Creek’s Ouray, would be wonderful here. A softer cheese, such as a sharp, aged cheddar, works beautifully as well, but if the cheese gets too soft (mozzarella, fresh goat cheese), it tend to completely obscure the apple. Any mild fresh herb in season, like basil, thyme, summer savory or oregano, would work here. Omelets are best eaten hot and fresh. If there is any leftover, refrigerate and break up the eggs for use in another recipe.